Harley riders have always been the epitome of cool. But lately, bikers have taken their love of riding to a whole new level when they’ve ridden the bikes they adore on their wedding day. The idea of a Harley Davidson wedding is so hot that it’s even attracted celebs. This includes such hotties as supermodel-actress Denise Richards, who hopped on a motorbike after saying her I Do’s to hubby Aaron Phypers in 2018. If the idea of riding a motorcycle into the sunset with the love of your life sounds like your idea of a dream wedding, this post is for you. We’re sharing 6 Harley Davidson wedding ideas for serious Harley-lovers here! For many biker brides and grooms, the first love to capture their heart wasn’t the one who’s meeting them at the altar to exchange wedding vows. Your beloved may be the one who revs your engine today. But, they probably don’t share the horsepower of a Harley, now do they? Some bikers are out to prove that it’s possible to have both loves of their life…on the same day. Here are 6 inspiring Harley wedding ideas for all the bike-lovers out there who are tying the knot. If your bride or groom-to-be doesn’t share your biker infatuation, that doesn’t mean you have to give up riding. Gather up your gang for one last ride before you give your heart away. Showing up with your wedding party pals to your pre-wedding festivities is cooler than cool. If both you and your soon-to-be spouse share a fondness for the driver’s seat, why not take two bikes to the wedding chapel? You can choose to arrive at the ceremony on two separate bikes, even if you’re planning on leaving as one. Perhaps your wedding day celebration includes a church wedding and an after-party at a separate destination. If you want to include your Harley on your big day, but prefer alternate transportation when you drive off for your honeymoon, then take a bike ride to the next stop. This is a great option for couples who are looking to compromise with a less-than-enthusiastic partner. There are plenty of wedding car hire options that can sweep you away from your final stop to appease even the pickiest significant other. And, this is one way that the bride and groom can both take the ride of their dreams on their wedding day. If distance and weather are suitable, you might suggest hopping a Harley for the ultimate wedding day send-off. With your bride on the back of your ride, it’s hard not to look like one of the coolest couples ever to get hitched. Will you be taking off for a private ceremony that includes just the two of you? How about eloping to your wedding destination biker-style? You might even forgo traditional wedding rings and gift the love of your life with a new bike of their own. It may be going too far from some brides and grooms, but you could always zoom up to the altar, instead of taking that long walk down the aisle. Want a Harley Honeymoon Instead? If you still aren’t convinced (or haven’t convinced your spouse-to-be) that you need to have a Harley Davidson wedding, don’t worry. There is still plenty of time to enjoy biking with your babe. How about a Harley honeymoon, instead? 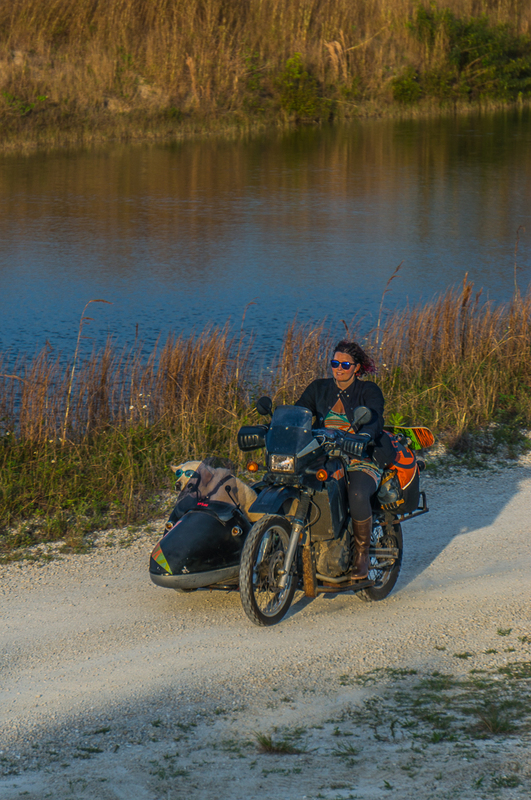 Check out this post for motorcycle travel advice and get ready to take on the world with your new love! Sometimes when the ride is almost over and you are closing in on home, have you ever had that feeling of wanting to just continue to ride? 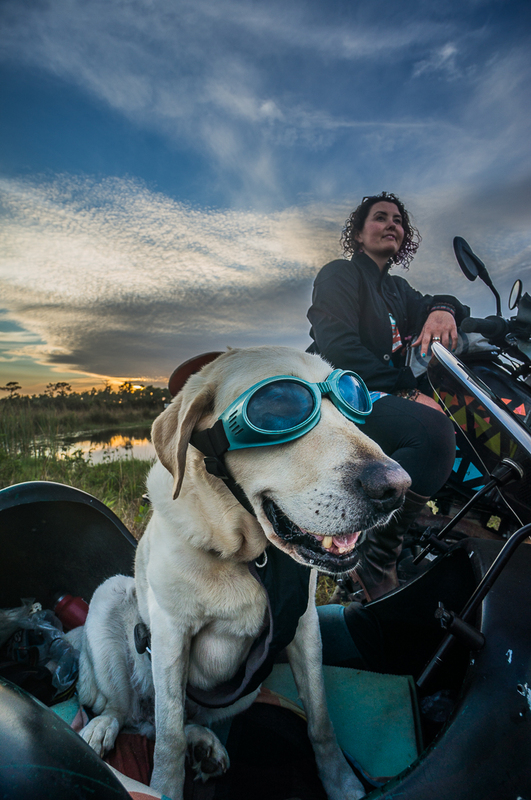 On and on till the sun sets and beyond… Meet Rufio the KLR650 Moto-Sidecar, Baylor the sidecar dog and of course lovely Mallory Paige who has accepted the challenge of the ongoing ride in what she calls: Operation Moto Dog! One day you decided to go on a ride longer than usual, how come and what’s your destination? Prior to Operation Moto Dog, I’d never even driven a motorcycle! In October I’d ridden passenger for a brief time in Ecuador and was immediately hooked. I spent the next few months scheming about a motorcycle adventure to Alaska. And in May decided to ignore all the experts telling me it would be impossible and just go for it. I got my motorcycle license, bought an old motorcycle and even older sidecar, learned to weld, built a subframe to attach the two, and christened the rig Rufio. Then on June 15, I loaded Baylor into the sidecar and we hit the road for Alaska. More than anything this adventure was prompted by a desire to grow into the adventurer I envisioned. Having traveled around the USA in a vintage VW van a few years ago, I knew that some of the best lessons happen on the open road. And committing to a big goal, meant I would have no choice but to figure things out. I’d absolutely have to learn how to camp alone, to turn a wrench, to navigate, troubleshoot and turn strangers into friends, it’s the only way I’d make it across North America. That is brave, to never have driven a motorcycle and then this! Some might be a bit scared to make a such an adventure by them self, what do you have to say to them? I’d tell them what I once told my sister: It’s not about being fearless. There have been and will continue to be days, nights, minutes and moments where I’m scared. From getting the heebie jeebies camping in the backwoods, to feeling completely overwhelmed and lost in a new place, fear is an essential ingredient to stepping out of your comfort zone and growing. Luckily, it’s also a muscle that can be trained. The more you face fear, the easier it becomes to tame your lizard brain and carry on without letting it rule your decisions. And for the travelers – especially the solo females – that worry about strangers taking advantage of you on the road, I’m thrilled to report that I’ve found the absolute opposite to be true. Everywhere we venture people go out of their way to say hello, extend kindness, support and hospitality. People are good. This I will always believe. Sounds amazing! And I guess you always have Baylor if things get to much…:) I read you got some support from fellow bikers/people you meet aswell? Since I wasn’t previously a rider, I really had no idea the strength and breadth of the motorcycle community. En route to Alaska, we experienced a series of obstacles. 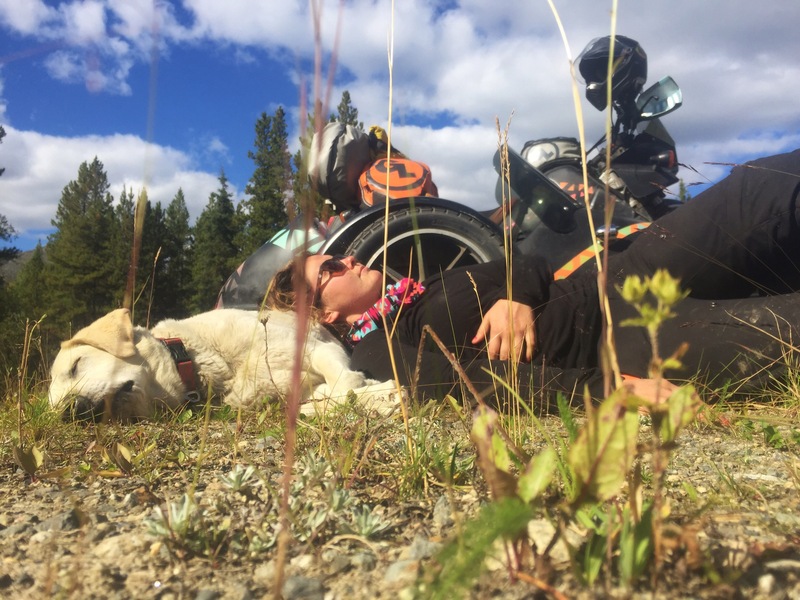 From the most unbelievable breakdown miracle in the middle of nowhere Yukon (read that here: http://mallorypaige.com/omd-travelogue-day-15//) to a series of unknown noises and oil burning concerns, I quickly realized I could not do this alone. That I would need the expertise and assistance of the rider family to make it to Alaska. And, oh boy!, did they come together to help us. From strangers across the country sending funds to help with the piston replacement, to Alaskan motorcycle legends hauling us hundreds of miles and teaching me how to tear apart the engine, it was truly a turning point in the adventure. In that moment, it became more than just a road trip to Alaska. It quickly transformed into a life changing mission to visit all of North America. A million times over, I could not do this without the kindness and hospitality that we’re shown each day on the road. 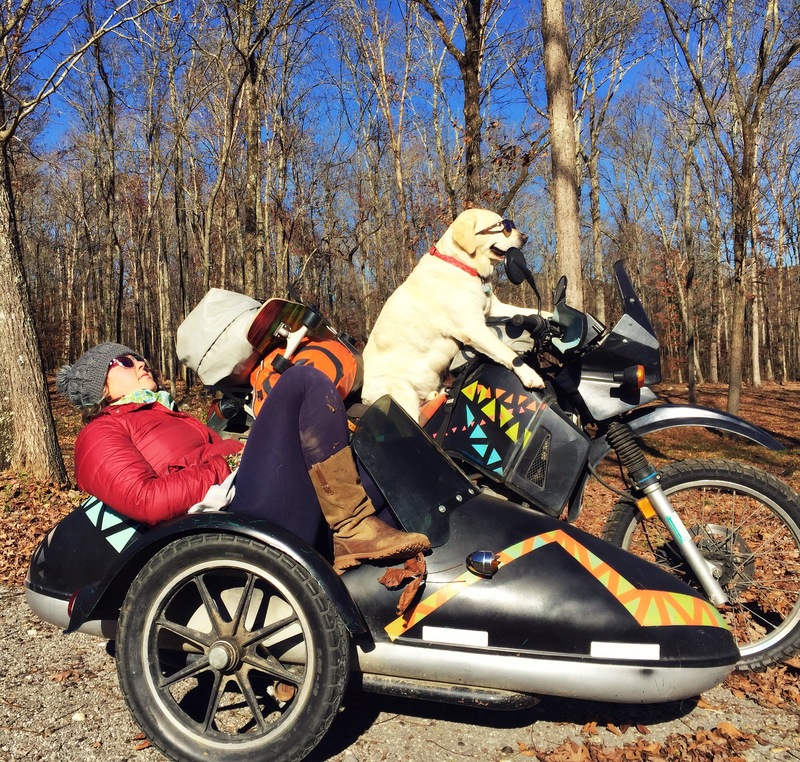 The sidecar had to happen because there was no way I was going to leave my copilot behind. My dog, Baylor, is an adventurous yellow lab, who has been at my side for the last 10 years. Whether stand up paddle boarding down an Oregon river, climbing Colorado mountains, island hopping along the Florida coast or just snuggling up to read a book, he’s always ready for the fun. And it was amazing how well he took to being a sidecar dog. After a few days lounging in the sidecar while I metalworked in the shop, it was time for a test drive. We went through the routine we’d practiced – load up command, harness attached, goggles on, treat dispersed – and I began rolling around the parking lot nervously. I looked over at Baylor not sure how he was going to react and then had to laugh out loud. 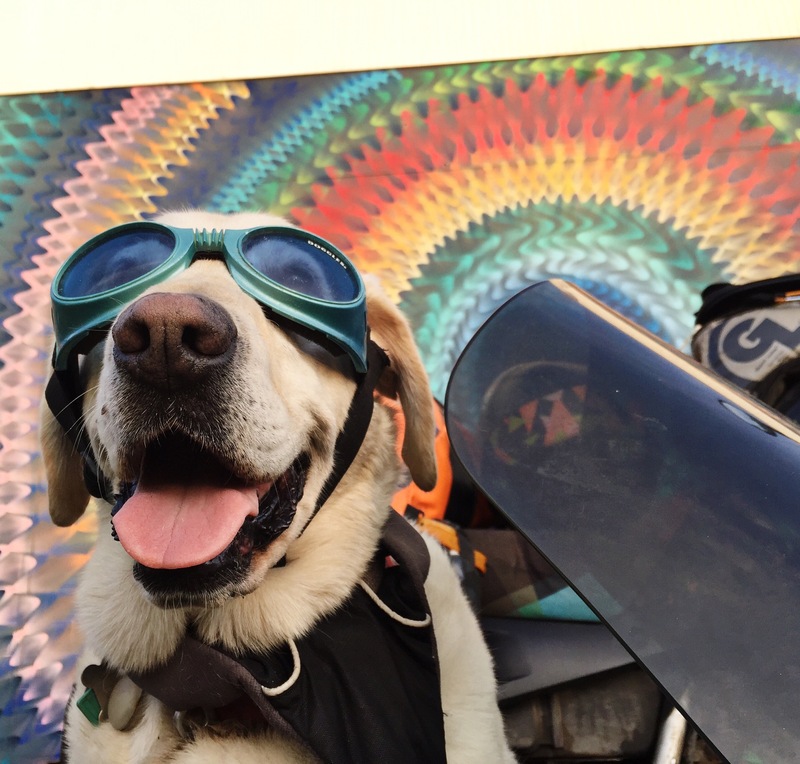 He looked up at, sighed in boredom, and laid down to sleep – he was meant to be a motodog. It was the moment I knew Operation Moto Dog was really going to happen. Two days later we were Alaska bound. Give us 3 tips for the life on the bike? Simplify – I’m constantly analyzing what I’m packing. En route to Alaska I tossed the pillow (my riding pants suffice just fine), in Kansas I reorganized everything so the camp essentials lived in a single bag, in North Carolina I got two Sea to Summit compression bags and rejoiced at the space we were saving. For the most part, you probably need less than you imagine and too much stuff just becomes a packing hassle when you load and unload day after day. Eliminate Excuses – Early on I decided I’d rather be uncomfortable doing it, than comfortable still home planning it. This meant I didn’t worry about having the absolute ideal gear or being perfectly prepared, because I knew no matter what I was leaving with what I had and would make do along the way. This has made for some uncomfortably cold, wet days and extra challenges along the way, but to me it’s worth it because I’m out there doing it instead of letting little excuses prevent me from going on the adventure. There is No Right Answer – Some people plan their adventures for years, some just wing it. Some pack everything they could possibly need, some are the ultimate minimalists. Some go fast and far in a day, some mosey and soak it all in. Everyone has a unique style; that’s the fun and interesting thing about life. Don’t worry about what everyone else is doing. There is no right answer, just do what works best for you.